“My ethos is a dedication to ensemble playing while at the same time giving the individual performer space to develop, find and inhabit the world of the play, a world which, as much as possible, we find together . I find it equally important to create startling images, to create meaningful character and make full use of the text. I enjoy working primarily through Chekhov Technique, but also use a variety of techniques to bring out the best in the performer. 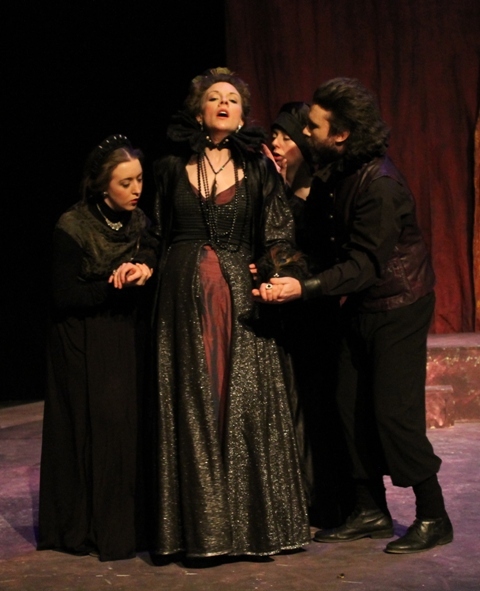 Duchess of malfi 2015. Muireann Ni Raghallaigh, Zita McGowan Reidin ni Thuama and Eoin Dillon. I have found it invaluable that I had an actor training [at LAMDA] and worked as a professional actor for seventeen years before I seriously moved into the other areas. Likewise, my experience as a playwright gives me a strong contact with overall form. The teaching has helped me work and develop performers of varying abilities and with different challenges. Most of all, my work ethos is very much that creating theatre is a GROUP endeavour, and while I am decisive and dynamic, I am also aware that I am not the only person who is in the creative arena. I have run two professional companies, Commonweal, dedicated to classical ensemble work, and Theatrecorp, for World Classics. I find my main area of interest lies in classic work or devising or an amalgamation of the two. I have done several productions at NUI Galway Drama, most recently a production of Twelfth Night with students, a poetry performance piece called The Sacrificial Wind, by Lorna Shaughnessy which discusses the politics of War, performed at the Seamus Heaney Homeplace in Bellaghy, Northern Ireland and in Galway . For full listing of my directing work, please go to my full resume.